Atlas will help Madagascar plan a more sustainable future. Vegetation data was synthesized into a map-based information system. All information was integrated within ArcGIS. Madagascar is the world's fourth largest island and is recognized as one of the world's top 10 hot spots for biodiversity. It is estimated that there are between 8,000 and 12,000 plant species on the island, and of these, 80 percent or more are endemic. People arrived in Madagascar just 2,000 years ago and have cleared much of its globally important primeval forest. The uniqueness of its plants has made Madagascar of paramount importance to international conservation efforts. Landsat ETM image (left background), vegetation classification (center), final product for publication (right). The Royal Botanic Gardens Kew (RBG Kew), United Kingdom, has been working with the Critical Ecosystem Partnership Fund and Malagasy partner institutions to gather and synthesize vegetation data from fieldwork and satellite images into a map-based information system. This has culminated in the production of the first vegetation atlas for Madagascar and a Web site that will help Madagascar's government and people plan a more sustainable future. The mission of the Royal Botanic Gardens Kew is to inspire and deliver science-based plant conservation worldwide, enhancing the quality of life. An accurate and updated vegetation map is imperative for conservation planning and natural resource management in Madagascar. It is also essential that the data on which such a map is based be made freely available so that conservation organizations, government departments, academic institutions, and other stakeholders can use it as an up-to-date standard dataset on which to base their activities. 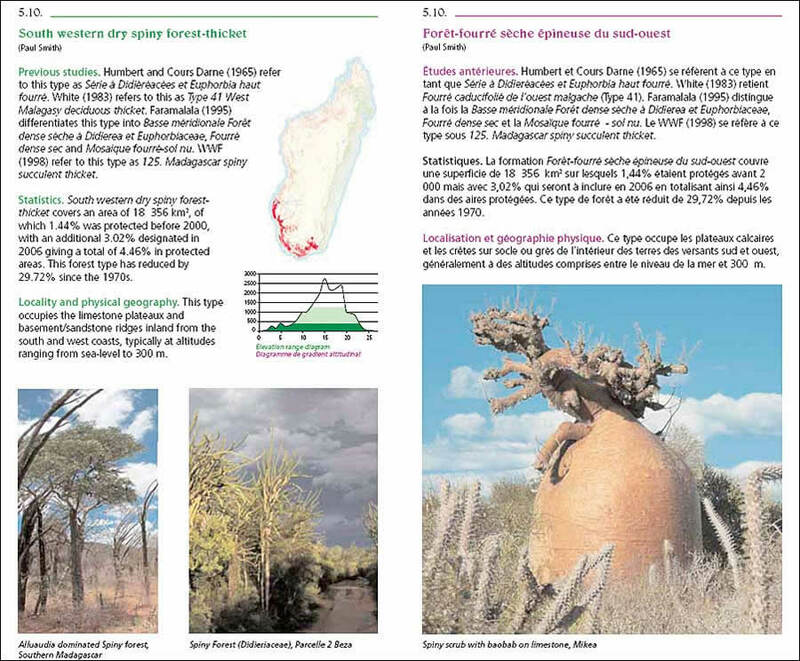 The electronic version of The Madagascar Vegetation Atlas is available on RBG Kew's Web site (www.vegmad.org), and local experts are invited to continually improve and update the map. For a vegetation map to fulfill its intended role, it must accurately delimit areas with various vegetation types as they currently exist and assign those areas to objective categories that can be easily recognized in the field and that reliably reflect fundamental biological differences (primarily structural features, for example, physiognomy). The precedent for the mapping methodology used was from Frank White's Vegetation Map of Africa (1983), along with remote sensing; ground truthing; and drawing on the wealth of information at national, regional, and local levels. White's map took more than 20 years to produce, but thanks to huge advances in remote sensing, GIS, and communication technologies over the past two decades, the Madagascar atlas has taken a fraction of that time. In addition, the project involved extensive field surveys using GPS-enabled PDAs and ArcPad, which facilitated rapid and accurate interpretation of the vegetation patterns on the ground. Initially, classification (by the Center for Applied Biodiversity Science) was carried out using monthly composites of moderate-resolution imaging spectroradiometer (MODIS) imagery to give information on phenology (plant seasonality), which provides valuable data about the probable vegetation types. Landsat imagery was then used to "cookie cut" the forest versus nonforest stratification to give finer resolution. Next, this preliminary map was refined in two ways: through extensive ground survey and through further interpretation of recent Landsat imagery. Expert knowledge was gathered at a series of workshops, as well as from fieldwork and through a Web site powered by ArcIMS. Critical regions were highlighted where additional fieldwork and/or satellite imagery were needed. All information was collated within ArcGIS, allowing updates to be uploaded to the Web site and the recording of all the fieldwork data and comments. At all stages of the compilation process, satellite and map data has been made available through the Internet, both as GIS layers and as general maps that users can view. 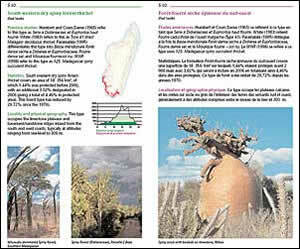 A page from the atlas describing the unique spiny forest of Madagascar. The final producta user-oriented, simple-to-apply, up-to-date, accurate vegetation atlas at a scale of 1:500,000was presented to the user community in hard-copy and digital formats at a meeting held in Madagascar in April 2006. As many potential user groups as possible were invited, including conservation organizations, government departments, academic institutions, and private companies. The draft map was presented to, and its accuracy and application tested by, more than 40 participants from 25 institutions and organizations. The recommendations from the users' workshop were incorporated into the final product. The final atlas contains descriptions and photographs of each vegetation type, with statistics on levels of protection, rates of degradation, elevation, climate, area, and conservation importance. All of this has only been possible using the full power of GIS, remote sensing, and very dedicated teams in Madagascar. The Madagascar Vegetation Atlas has been developed to support the aims of the Malagasy government's own initiatives, such as the Durban Vision Process, Madagascar's environmental action plan. Specifically, the atlas supports Madagascar's Programme Environmental 2, with emphasis on gathering data from the field, and Programme Environmental 3, using that data to manage the environment. In addition, this project perfectly encapsulates the Critical Ecosystem Partnership Fund investment strategy in that it represents an all-inclusive collaboration between specialists from botanical institutions, conservationists from international and local nongovernmental organizations (NGOs), and land-use/natural resource managers. 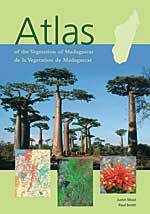 The Madagascar Vegetation Atlas is available at www.kewbooks.com. For more information about this work, see www.vegmad.org. For more information about RBG Kew's GIS unit, visit www.kew.org/gis or contact Justin Moat, GIS Unit manager, Royal Botanic Gardens Kew (tel. : 44-0-2083325276, e-mail: J.Moat@kew.org). Please see "GIS in Climatology" for information about another atlas that may be of interest to you featured in this issue.